One of the key themes currently at the forefront of the collective mind of the water industry is innovation. There are clear targets and objectives set out by Ofwat and Water UK, alongside the industry’s own recognition that innovation is essential to the evolution of all organisations and an ever-growing expectation from customers, that water companies must learn and adapt. Innovation is one of the cornerstone values on which Water Direct was founded and we were very proud that this was recognised with a finalist place in the 2018 Essex Business Excellence Awards, Innovation and Technology category. This award celebrates companies that have made strides in their field through the creation or introduction of new ideas. As a company we are deeply invested in our team and the working environment. We believe in promoting health and well-being alongside personal and professional development and this investment creates an environment where ideas are welcome and can flourish. Our people are at the heart of what we do, and employees feel valued when their efforts are recognised. 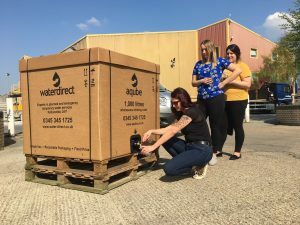 Our innovative Aqube™ is a great example of an innovative and unique product, born from an idea by a member of our team who recognised that customers were seeking alternatives to bottled water, as well as solutions with reduced impact on the environment. Innovation means looking for new or different ways to approach challenges and opportunities. If you keep doing what you’ve always done, you’ll keep getting what you’ve always got. We believe in creative thinking and to promote a culture of innovation within Water Direct, we listen to the ideas and implement them where possible. To ensure we remain genuinely innovative, we created the Water Direct Innovation Forum, a group that meets regularly to explore new ideas and find practical ways to explore those. Recent ideas developed via the forum include a new technology which can improve our network injection process. This approach is innovative in itself, and we are already helping our water wholesaler partners meet reduced supply interruption time targets. We seek continual improvement and challenge our processes all the time. We ask our customers for feedback and we listen to what they tell us. How can we learn? What can we do better? Is there a different approach that could be taken to improve the delivery of one of our services? Through this approach we ensure we have a thorough understanding of our customer’s needs. Understanding the problems and challenges they need to overcome is what helps us develop innovative solutions. For example, we recently collaborated with one water wholesaler to refine their doorstep delivery service, providing improved alternative supply to their most vulnerable customers. Over the last year we’ve made significant investment in our fleet of state-of-the-art tankers. 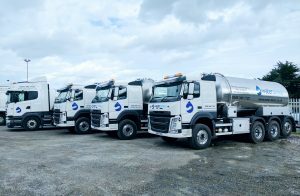 We’re proud to operate the largest fleet of commercial drinking water tankers in the UK. These tankers are unique to Water Direct and include innovative features, including pump sets specifically designed by us to meet the demands of the markets we serve. We’ve also invested in the development of pop-up emergency bottled water stations which can be deployed in key locations during a water supply incident to help visibly improve customer service. Our core expertise is helping customers to build resilient solutions. In the water utility sector, we work with both wholesalers and retailers to meet the growing and changing needs of the industry. Through our innovative approach to collaboration with water retailers for example, we help to proactively address the needs of the non-household market through a unique added-value partnership model. These bespoke partnerships enable the provision of alternative water supplies to non-household customers through a mechanism designed to suit each retailer. Our innovative WaterTight™ contingency planning service is particularly popular with retailer customers who are responsible for creating and maintaining their own contingency plans for water. For our wholesaler partners the Nationwide Bottled Water Bank is a fantastic example of the innovative approach that drives Water Direct. This nationwide stock of quality assured bottled water (currently standing at over 3.5 million litres) is stored, managed and deployed from more than 20 locations across the UK to enable swift delivery wherever and whenever it’s needed.